The world is moving for smartphones and 2015 was the year of smartphones we can say. Even in april 2015, Google official announced that mobile friendliness for websites does matters and it will affect your search engine ranking too. 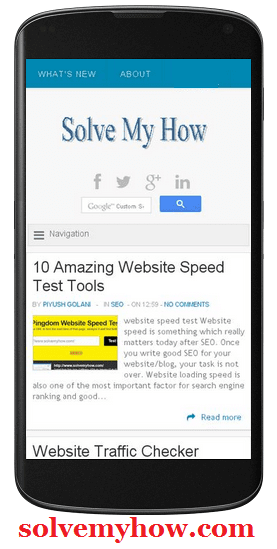 Even the sites which are not mobile friendly, penalized by Google. You must use responsive template for your blog or website. You can run mobile friendly test here ! We will see couple of more such tools in the next post but today lets see how to check mobile website speed and loading time. In my last post we have already seen 10 Amazing Website Speed Test Tools but as I said, you can't neglect/ignore mobile phone users. So, we will take care of those users via this post. If you have missed the above post then just go through it right now and run the test, then simply fix the errors for providing good user experience to your web users. If I personally talk about my experience, I'm getting double traffic from smartphones as compare to desktop or laptops for SolveMyHow. So, its like 2:1 and if you're really ignoring your smartphone users then I must say you're really making huge loss. Even many professional bloggers had already launched iphone and android apps as they are taking it very seriously. Even you could do the same and it will guaranteed increase your blog traffic. So, in this tutorial I will show you some top tools to check mobile website speed which also gives you full analysis report with bugs and errors. It will let you know the factors affecting your mobile site. So, your task is to know those things properly and try to fix it. This is really a powerful performance tools developed by google engineers. It will go through your website/blog template and let you know all the factors affecting your site. It will also give you how-to do guides links also. So everything will become pretty easy with this. Few days back, when I run this test I found that my mobile site speed is only 35% and it gave me all the errors which were affecting my site with proper suggestions. So, I tried to fix all those errors which were very necessary to fix soon as it started affecting my income also. Now SolveMyHow mobile page loads in "1.01 sec" and current mobile speed is 72. You can see it in the above snap shot. P.S I will soon start complete tutorial series "to decrease your website loading speed" but for now lets stick to this tutorial only. This is second amazing tools to check mobile loading time and performance speed. Currently it offers this services for android phone users only. Android users simple open GTmetrix from their phone. The next thing you need to do is create free account. After that complete one verification process and you're ready to use this tool. After that, just enter the domain you wanted to test and select "chrome (android, galaxy nexus) for test format. Atlast simply click on "Go" button. The specialty of this tool is, it will give you mixture of PageSpeed Insights and Yslow results. You will also get the recommendations from this tools i.e which things you need to improve to decrease mobile speed loading time. P.S Yslow tools is developed by yahoo. So these were 2 amazing tools for mobile website speed test. At this point I found only these two best tools for checking mobile site performance and loading speed. I'm pretty sure in coming days we will see some new tools targeted for mobile website only. But for now you can go ahead and check your mobile site and do share your results with me in the comments. Also don't forget share this post with your friends on Facebook, Twitter and Google plus. You can also subscribe for SolveMyHow newsletter to get latest updates for SEO and blogging tips and tricks right into your inbox !